Well, the dust has settled on the Associated Powder Coating Victorian Title, and what a night we had! 18 cars braved the Wangaratta heat, but in the end it was our own Louis Rodriguez who claimed the VIC1 Title in a flawless drive in the final. He didn’t put a foot wrong on a slick track, holding a 3-5 car advantage for the green flag running. He held off a fast finishing Gary Hudson, who impressed in his first outing with the Victorian club, claiming second. It was great to see so many NSW drivers make the trek down. Ayden Elliot and Rod Francis both out in solid showings to claim 3rd and 4th respectively. Butch Hutchison rounded out the top 5. 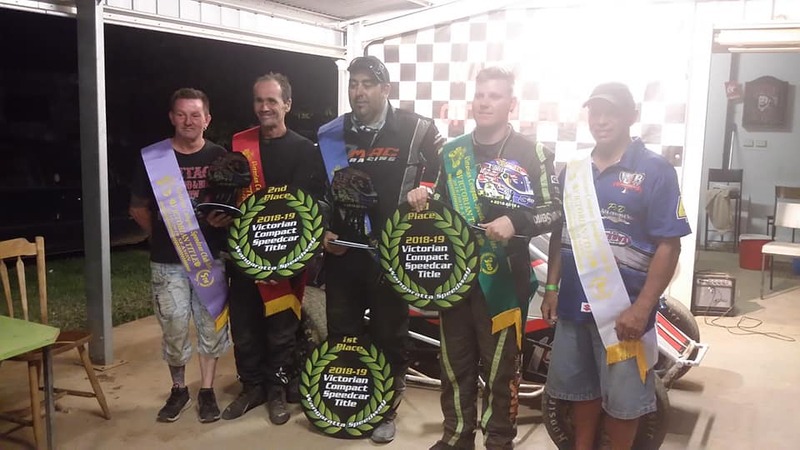 Speedcar driver Ash Booker showed great pace all night, taking out two heat wins and the Kitten Car Care Products best presented car, but luck wasn’t on his side in the final, losing a sump plug while running third in Brad Day’s car. Justin Paull also didn’t get the rub of the green despite showing good pace early. Pole sitter Mark Heaton’s night came to an end at the start of the title race with fuel pump issues. A big thanks must go out to everyone that helped make the meeting possible, our naming rights sponsor Associated Powder Coating, and of course, the drivers, crews and families.